Black Cardamom (Amomum subulatum) is one of those spices that I use rather often, but about which I don’t know much. I first encountered it in the kitchen of the Pakistani/ Bangladeshi couple who were my first personal chef clients. The box was marked in Hindi and transliterated Hindi (Hindi in English letters) as “Kali elaichi” and for a time, I only knew it by that name. I finally found a photograph of the big, hairy-looking seedpods in Monisha Baradwaj’s excellent book, The Indian Spice Kitchen in the same entry as true cardamom (Elettaria cardamomum). From my first experience with this spice, I was captivated by its smoky scent and medicinal flavor. I used it with a spare hand in meat dishes for my clients, and then, after finding them at the local Indian market, in meat dishes in my own home. 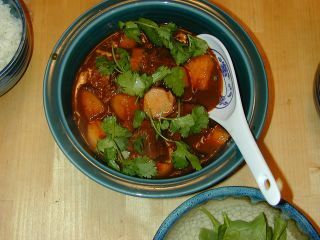 I really love the sharp smoked savor it gives bhoti gosht, a simple dish of meat (I usually use beef, but lean lamb is also delicious) cubes braised with spices quickly in a pressure cooker with minimal liquid. After the meat is tender, the pressure is released, the lid is removed and the water is boiled away, leaving only the meat cubes coated in a paste of wet and dry spices, including black cardamom. According to Gernot Katzer’s Spice Pages, like true cardamom, black cardamom is a member of the ginger family, and is used all over Northern India. Many books consider it to be an inferior substitute for the more familiar, smaller green cardamom pods, but both Katzer and I agree that this is not so–the spice is used in its own way and in its own right in different dishes than green cardamom. For example, green cardamom is used in both sweet and savory dishes, particularly the refined dishes of the Mogul tradition, while black cardamom is used exclusively in savory foods, and it tends to be used in more rustic, homestyle foods where its camphorous aroma enhances the strong flavors of ginger, garlic, chiles, cloves, cinnamon and black pepper. I was excited, years later, to find out that it is also used in the cuisine of Sichuan. When I joyfully got my hands on a copy of Fuchsia Dunlop’s excellent Sichuan cookbook, Land of Plenty I was thrilled to discover a recipe for a dish I had eaten several times and enjoyed immensely as a waitress at Huy and Mei’s restaurant, Red Cooked Beef with Turnips. Every other red-cooked beef recipe had not included the black cardamom, which in Mandarin is called “Cao guo,” and when I tried them, they never tasted right! I had despaired of ever tasting that beloved homestyle dish again, until I tried Dunlop’s recipe and as the beef slowly braised over the course of the day, the scents that had lingered in my memory for over a decade began wafting through my house. I knew before I even bit into my first taste of it, that Dunlop had guided me to Huy’s recipe and I was intensely grateful. In Chinese medicine, Black cardmamom is used to alleviate cold and damp in the digestive system, particularly the spleen, and is used to help prevent pregnancy induced nausea. (That is good for me to know!) It is also used to prevent miscarriage. For my recipe using black cardamom, I present to you Fuschia Dunlop’s Red Cooked Beef with Turnips–one of the very first recipes I presented on this blog, months and months ago. It is a very warming dish, and in the coming days of autumn, will be very welcome again at my table, when I can stomach the strong smell of beef again! Fascinating, I never even heard of this spice! One of the things about it is that the husk is rather hairy. And it’s easy for it to get physically lost in a curry (not the flavour – it’s quite a bit stronger than green cardamom). I have to say that I am not wild about suddenly finding myself chewing on the husk with seeds attached – I can’t help but associate it with sand, even though it doesn’t taste like sand. However, it really would be just the thing for biryani, wouldn’t it? Okay, you’ve convinced me. We’ll get some black cardamom next time we’re in India Town. My ex-Mother-in-Law from Delhi used to also use black cardamom in tea. Her tea was delicious and the black cardamom gave it a special flavor. I haven’t been brave enough to cook with it yet (the smell reminds me strongly of mothballs, which I hate), but it was used a lot in historical Chinese cooking, at least back to the Yuan. 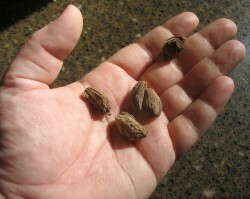 It’s usually called tsaoko or tsaoko cardamom (sometimes caoguo) in recipe translations. Land of Plenty is one of my favourite cookbooks; I recently blogged a recipe from it for the weekend cookbook challenge event. Was hoping to participate in Spice is Right but I missed it this time! Looking forward to contributing in the future. -crushed seeds in making of masala chai(tea)-this paired with a couple of seeds of black pepper, a few seeds fennel and about 1/4 ” piece of fresh ginger constitute the sure cure for a cold! Love your blog, Barbara!All the best! Whatever happened to your round-up for this spice blogging event? I was so looking forward to it! My daughter was born on September 16th–the day I was going to do the roundup. I was also quite excited to discover, just now, that black cardamom is used in Chinese food, because that means I can buy it in China at local prices. Admittedly, I plan to use it as a (possibly inferior) substitute for green cardamom.